They've been jolly polite over at New British Comics: editor Karol Wisniewski sent me a copy of #2 eons ago (long before Wasted #3, below!) and again, it's slipped through the cracks. Which it really shouldn't have, because NBC#2 is every bit as good as the first issue, released last April (reviewed here on downthetubes). Not only does it have a terrific line up of creators, culled from indie talent in the UK and Poland, including Dan White, Dave Thomson, Pawel Gierczak, David Hailwood, Tony Suleri, Maddku, Jacek Zabawa, Paul O’Connell and Rob Miller; it also features a great range of strips. Highlights of this collection, for me, are White's (biographical?) 'Last Summer'; Dave Thomson's phantasmagorical 'Feeding Spiders', worthy, surely of much wider exposure; Hailwood and Suleri's SF shocker 'Spare Parts', first seen in the Temple APA but well deserving second exposure here; and David Robetrtson and Frank Lamour's 'Under the Rainbow: Mercy' a disturbing tale of voodoo. But there is even more to enjoy in this fine mix of styles and genres. All right, confession time: Wasted Issue 3 has been on sale for postively ages and a review of this adult comic, available from specialist comic shops and online, is long overdue. The delay is not the fault of the Wasted team, who were not too zonked to kindly send me a copy for review simply ages ago, but my zonking out at the end of most days recently as I juggle several projects at once. The issue is a the usual eclectic mix of humour strips, featuring a cover by Simon Bisley and work by the likes of Alan Grant, Jon Haward, Gibson Quarter, Alan Kerr, Curt Sibling, John A. Short, Jamie Grant, John Wagner and many others. Highlights of the issue? For me, certainly the four-page 'Lusi Sulfura' by Alan Kerr, and the ever bonkers 'Tales of the Buddha' by Grant and Haward. 'The Steel Teacher' by Colin Barr, with art by Sibling and Jamie Grant, is another twisted gem, featuring a psychotic robot teacher looking not dissimilar to a once popular robot character from another comic, as its military programming reasserts itsef mid lesson. 'The Dopranos', with art by Jim Devlin is also great. Since the issue was sitting on the top of my reviews pile, threatening to savage me if I ignored it any longer, as you can imagine, more than one person flicked through it. I have to note that many of the strips raised a laugh, but for those who had seen Wasted #1 and 2, the feeling was that some of the drug and alcohol jokes were a little repetitive and, perhaps, a wider range of topics need poking fun at in future issues. Nevertheless, the good outweighs the humdrum and if you can still find a copy, do so, and consider giving it a try. The creative line up on this adult humour title is really impressive. I caught up with enthusiastic and inventive indy press creator Sean Azzopardi on Free Comics Book Day at Orbital Comics, London, where, among others, Kieron Gillen was tapping out a script and Tom Humberstone was busy sketching along with enthusiastic fans, copies of the brilliant Solipsistic Pop #2 on sale nearby. Sean recently finished The Sightings of Wallace Sendek, a collaboration with Douglas Noble, whose work includes Complex, Unfriendly Romance and Robotnik. "Douglas is a man of infinite patience, as this 22-page comic took over three years to complete," Sean says. It's a creepy tale, centring on the apparent disappearance of a famous, but fading musician, and one woman's seeming encounters with him after his death. Has she seen him or not? Drawn in an appropriate, haunting style, this is a book well worth tracking down and is on sale in shops well known for supporting the indy press, such as Orbital Comics and Gosh in London, as well as online. Not resting on his laurels, Sean's now busy working on a new story, Black Leather, featuring "Teeny rockers, hells angels, freaks, booze drugs and music." He's hoping to have the first chapter ready for the Leeds Thought Bubble convention in November. The latest issue of Panini UK's Doctor Who Magazine (Issue 421) sees the debut of the Eleventh Doctor in its comic strip pages, with the delectable Amy Pond in tow to boot. While Matt Smith's Doctor has already appeared in the BBC title Doctor Who Adventures, this is the first comic to feature him in DWM, in a story titled Supernature set on a distant, jungle-dominated alien world - the location of a penal colony where the human residents are turning alien themselves. The story by Jonathan Morris, who has written several Doctor Who stories for audio drama producers Big Finish, is drawn by veteran Who comics artist Mike Collins, with David Roach providing some superb inks on the opening episode. Fans will also enjoy a feature offering a guide to the TARDIS - reminding readers of rooms rarely or only ever seen once or twice on TV, including the infamous 'Boot Cupboard' (a full Regncy-style dining room) and the bath (a full-size swimming pool). While the TARDIS has been covered before in features, this is a pretty exhaustive and entertaining item, just part of another great issue of the Magazine. • There's more information here on the Panini UK web site (although this is actually a 'pop up', you may want to navigate to it from the main site at www.paninicomics.co.uk). Alternatively, check out the latest news from the Magazine team on Facebook. The latest issue of Doctor Who Adventures - which now has its very own official web site at www.dwamag.com - features the usual mix of features and comic strip aimed at a younger audience than Panini's Doctor Who Magazine including a fantastic FREE Weeping Angel mask. This week's monster mag is crawling with Weeping Angels and comes with a Angel mask... don't blink! Along with the usual comic strip, features include top moments from The Time of Angels, hilarious bits from the Eleventh Doctor's first adventure (involving a lot of food he can't stand) and a lowdown on the new Doctor Who Adventure Games, a Dalek quiz and am exclusive competition to become the editor of Doctor Who Adventures for the day. With the Eagle and its best-remembered character Dan Dare celebrating a 60th birthday this month, fans will be pleased to hear that several items are either in development or already on sale now to mark the event. • The collectable Dan Dare figure from Day2Day, already featured on downthetubes, looks on course to go on sale later this Spring/Summer. • Orion Books are producing Dan Dare, Pilot of the Future: A Biography and an Eagle Diary (for 2011, but released this summer). "It should be in the shops August," says Dan Dare biography author Daniel Tatarsky, who also wrote Eagle Annual of the 1950s and The Eagle Annual of the Cutaways . "I can't say too much but it should be a nice reminder of the diaries that were issued in the 1950s and will include various highlights from Eagle," says Daniel. "We're going for the retro look again but without the distressed cover." • As we previously reportedRussimco, best known for its wooden toys, will be launching several toy products this year. The range has yet to be finalised. • Simon Spicer (who also do the wonderful Ladybird retro paper products) have already launched a range of Dan Dare cards and wrap which have already launched. The full range is on sale at www.simonspicer.com. Notebooks are on their way. • Titan Books will be releasing Dan Dare: Trip to Trouble/Project Nimbus later this year. Safari in Space is still on sale in all good bookshops, as is Classic Bible Stories Volume 1 . A second Bible Stories collection is in development by the company for Easter 2011 featuring Frank Bellamy's David: The Shepherd King and The Great Adventurer, the story of Saint Paul, which was drawn by Frank Hampson, Jocelyn Thomas and, for much of its run, Norman Williams. More licenses are in progress, and we'll have more information on these as they near release date. We still haven't heard anything more about the rumoured Dan Dare movie from rights holders the Dan Dare Corporation, but we have our collective fingers crossed! A panel on 60 years of the lantern jawed space pilot. Alex Fitch will be talking to: Garry Leach, who drew Dan’s return to print in 2000AD, ten years after the end of the original Eagle, in the late 1970s and more recently covers for Virgin comics’ revival of the ‘Pilot of the future’ in 2008. Rian Hughes, who drew the Eagle-inspired comic The Science Service in 1989 and then the Mekon’s final revenge in the Thatcherite satire Dare in the adult comics Revolver and Crisis a year later; Gary Erskine, who drew Dan Dare’s most recent official comic book adventures in the Virgin Comics periodical of the same name; Titan Books Dan Dare collections editor John Freeman, who previously wrote The Science Service and now writes the strip Ex Astris in the Dan Dare magazine Spaceship Away; and Rod Barzilay, the editor and one of the writers of Spaceship Away. Alex Fitch hosts a panel on the British arm of the American Superhero publisher, featuring: Dez Skinn, a pioneering Marvel UK editor who launched titles such as Hulk Comic and Doctor Who Magazine , which featured early licensed work by Alan Moore, David Lloyd, Pat Mills and Dave Gibbons; Dan Abnett, who gave Captain Britain a new, darker spin in the 1990s by adding him to an Arthurian team of heroes with Gary Erskine, co-creator of the Knights of Pendragon; John Freeman, who edited many of Marvel UK’s early 1990s titles such as Death’s Head II, Warheads, Killpower and Motormouth, contributing strips to several issues as well, and also edited Doctor Who Magazine; and Simon Furman, primary writer for Marvel’s Transformers, and a dozen issues of Doctor Who Magazine. He created some of Marvel UK’s most memorable SF titles including Dragon Claws and Death’s Head. (With thanks to Alex Fitch): As part of Free Comics Day on Saturday 1st May, We are Words + Pictures will be launching their new, free newspaper format comic Paper Science II at Orbital Comics, 8 Great Newport Street, London WC2H 7JA near Leicester Square Tube. Sporting a brand new cover by Philippa Rice, 500 free copies will be distributed to distribute to anyone who comes in on a first come, first served basis. "We'll also be running a Drop In + Draw day there, featuring Tom Humberstone and Mark Oliver as well as the Mobile Library," say the team. This new edition of Paper Science has been created with the generous assistance of Newspaper Club. "They're printing us a 16 page, full-colour edition of 500 in time for the event. We'll also be offering a print-ready PDF of the paper on this site on Saturday under a Creative Commons license, for you to read onscreen or to take to a printer. You can knock up a run wherever you are, just let us know." We Are Words + Pictures are joined in this madness, in order of appearance, by Philippa Rice, Francesca Cassavetti, Joe Decie, Octavia Raitt, Becky Barnicoat, Daniel Locke, Anne Holiday, Matthew Sheret, Tom Humberstone, Luke Pearson, Adam Cadwell, Geof Banyard, Mark Oliver, Liz Lunney, Douglas Noble, Kristyna Baczynski, Anna Saunders, Kieron Gillen, Jamie McKelvie, Sean Azzopardi, Edward Ross and Marc Ellerby. The Newspaper Club was made by the Really Interesting Group, and is supported by 4iP, who think the web is wonderful and printed newspapers are a tremendous, highly-evolved way of reading stuff. "We think combining the two is a good idea. We're not about news or any particular form of content, we're about ink on newsprint. Whatever you think would be good to print that way; we think you're probably right." Concluding their month long look at the crossover between comics and film, Resonance FM broadcasts Strip! - The Art of The Losers this evening. Alex Fitch interviews Jock, the main illustrator of The Losers by Andy Diggle, the 32 issue comic book series published by Vertigo that has just been turned into an action film of the same name, based on the first half dozen issues of the comic. "It totally was [my big break],” Jock recently told web site Comic Book Resources. “Andy [Diggle] had done one little miniseries and I had done an issue of Hellblazer, but that was purely, Will Dennis said to me, to give me some kind of profile in the States. It was really just gearing up for The Losers. It was our first baby, really. "I’ve got to give a lot of credit to Vertigo for giving two unknowns a chance because they basically gave us the steering wheel of an ongoing series. Luckily, it went down okay." Alex also talks to Jock about his career so far, working on such characters as Lenny Zero and Green Arrow as well as Judge Dredd, both in print and on the forthcoming movie written by Alex Garland. 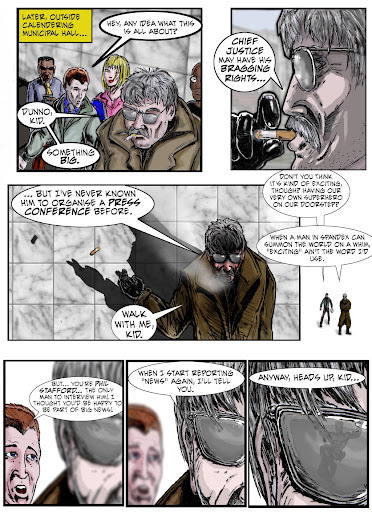 Mike Nicoll - my colleague and co-creator of the Ex Astris science fiction strip we're producing - has too much work on his plate at the moment and he's looking for a reliable UK-based inker to work with him. "There just aren't enough hours in the day!" says Mike. "I'm currently working on three CGI strips (Ex Astris and two others for a US company) as well as pencils and inks on a new project written by a rather famous UK creator for the European market - but John (Freeman) and I have two more projects which we're keen to get off the ground. 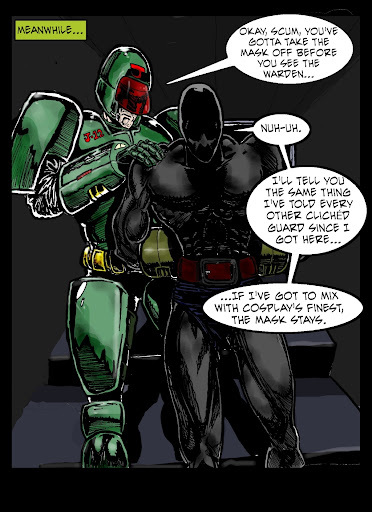 "Whilst I'm quite fast at pencilling, I'm criminally slow when it comes to inking -- so we need to recruit another member for our team who can take care of the inking." 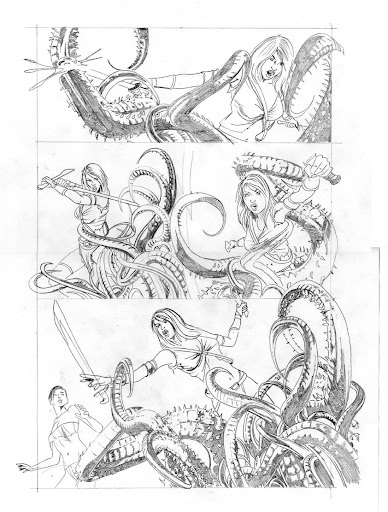 Mike has sent us pencil samples of his art from one of the new projects (click the image above for full size). Anyone interested in applying should send samples to mikenicoll@hotmail.co.uk. "Unfortunately there are no contracts up for grabs at the moment and therefore no guarantees of untold riches etc - yet!," Mike points out. "The new projects have not been approved for publication yet and so we can offer no money up front. But John and I have a pretty good record for getting our projects published so you'll just have to look at the art and decide if you feel we're worth taking a chance on." Comic creator Ian Hewett, who's also behind the mediablog Dystopian Fuschia, has just launched a free web comic, Destinauts. As they confront history head on, they encounter the unexpected and the impossible. Will they settle their own personal scores with their target? Is he as pure and good as people believe? And is there a far worse threat waiting around the corner? Creative blood, that is: the group is looking for artists and contributors for the new Back from the Depths Hallowscream 2010. There are plenty of good stories from quality writers and Scream! fans that need bringing to life. If you can help in any way or want to be a part of this project then please get in touch via the Back from the Depths forum at: http://backfromthedepths.ning.com. The original Scream! included Simon Furman and Alan Moore among its many contributors. The Comic Village at the upcoming London MCM Expo is looking more like a metropolis, with hundreds of fantastic creators already signed up for the 29-30 May show - including a visit from former Marvel UK editor in chief Richard Starkings, currently and rightly revelling in his film deal for Elephantmen. Stars returning to Excel this May include Ben Templesmith, Svetlana Chmakova, Jamie McKelvie and Kieron Gillen, and the event will also be seeing a host of new faces such as Action Comics and Captain Britain writer Paul Cornell, Robin Furth and lettering-legend and Active Images president and first tiger, Richard Starkings. The Comic Village will also sport something of an international flavour this time around, with comic circles, writers and artists making the trip to London’s Excel Centre from Spain, Germany, USA and Japan. And speaking of Japan, the anime presence at the Expo is set to be as strong as ever, with the latest releases and top deals from all of the major UK distributors, not to mention leading voice artist Kyle Hebert (Gurren Lagaan, Naruto, Full Metal Alchemist, Bleach) attending as a special guest. Bray Studios - considered the spiritual home of cult British films and the home of Hammer Film Productions for years - could be turned flattened and turned into homes, unless a new campaign to save it succeeds. Earlier this month, the Maidenhead Advertiser reported that current owners the Bray Management Company says the the operation - set to celebrate its 60th anniversary this year - is struggling to keep up with technological advancements. Once the home for Hammer Film Productions, a planning application was recently submitted to the Royal Borough for repairs to Grade II listed Down Place, the site’s central building. The application notes that the studios, formerly used to provide offices and facilities in connection with the film business, have been hit hard by the economic downturn and are no longer a viable business - and hinted at plans to turn the historic site into housing. Down Place was originally bought by Hammer Film Productions for use in their horror films, and then was gradually enlarged to become the studios that exist now. Films shot there include The Mummy, The Curse of Frankenstein, the Dracula film series and many more. Other films and television shows have used the studios down the years, including a number of shows produced by Gerry Anderson such as Space:1999 and for effects work on various Doctor Who stories such as Frontier in Space and The Invisible Enemy. The studios were sold in November 1970, but are still in use for recording, but, as a result of the current recession, faces stiff competition for business from nearby Pinewood Studios and elsewhere. The plans to level the site for housing came to light in an application to replace the roof and windows of Down Place which were discussed and approved at a Bray Parish Council meeting earlier this month. The documents discussed revealed a further application is likely for extensive work to convert the site into housing. "We quickly must look at the question of what can be done to help save the Studio," urges campaign organiser and Hammer Films expert Robert Simpson. "In the first instance we have to assume that a huge volume of cash is needed - Down Place itself is in an unhealthy state of repair. It needs a large amount of work done if the Grade II listed building is to be preserved. "...According to the information released Bray Studios is no longer viable as a business model - though we would suggest that the Studios need new capital investment to upgrade the equipment and allow it to compete once again," he continues. "The present owners clearly have no intention or desire to do that. Instead they see the chance for a quick profit in residential accommodation that will unburden them of their responsibility. Bray Management Ltd looks at the studios as property rather than a cultural landmark and facility. "We are open to ideas and suggestions, and ways of raising funds to keep the studios alive and within the film industry," he says, appealing to Hammer Films fans and the wider British film community for support. "We want to maintain its historic integrity, and allow it to flourish. We want it to remain distinctive. "Perhaps investors can be found with millions to spare on developing, upgrading and protecting the site? Perhaps there is a way we can find for a stay of execution allowing a campaign to build and find the resources before the site is compromised. "...Bray Studios is a true independent studio space, and some fine examples of British film and television have been made here. Don't let that be destroyed."